Caramel apple created with Daffy Apple Traditional Caramel and placed in a Clear Caramel Apple Box. Easter is fast approaching! 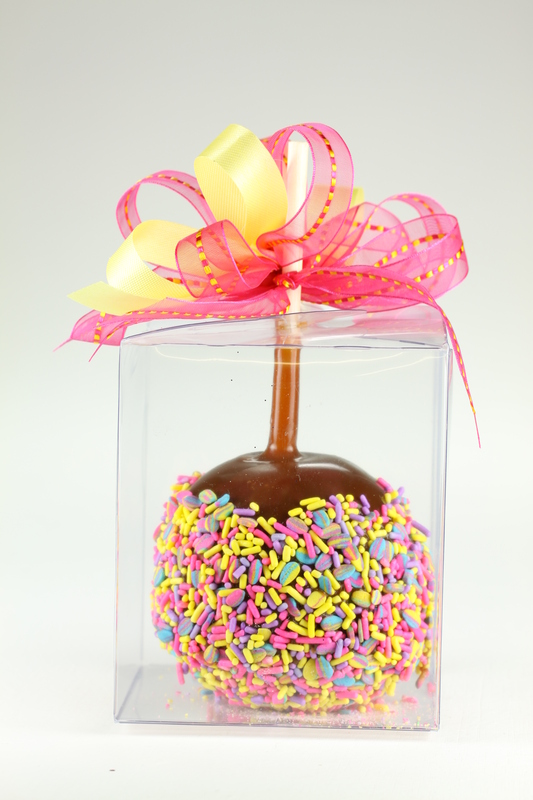 We think a basket full of caramel apples, dipped in spring sprinkles, would be a great gift for anybunny, or, er, anybody! Posted in Bulk Caramel, Daffy Farms, Decorating Ideas, Delicious Pictures, The Daffy Apple and tagged all natural, baker's caramel, blue, bulk caramel, caramel, caramel apple, caramel apples, daffy apple, daffy farms, dipping caramel, easter, easter eggs, eggs, event, pink, rainbow, shower, spring, traditional, yellow on April 14, 2014 by daffyfarmsblog. ← DIY: Apples and Caramel and Leaves, Oh my!